As part of its corporate commitment to providing clean, safe, attractive housing to residents, Kelson Group has recently completed a major undertaking in partnership with Fortis BC to replace an original boiler at Kelson Court Apartments in Prince George. The change means heat and hot water efficiency will improve by almost 30% at Building B, which is the first of three upgrades planned at the complex, and addresses risks related to failure of older equipment. The savings, along with Fortis rebates, are expected to help pay for the upgrades over a 6 or 7 year period. Kelson was approved under the Fortis Rental Apartment Efficiency Program, which encourages apartment building owners who are managing properties of 35 years or older to commit to energy improvements that can save money. 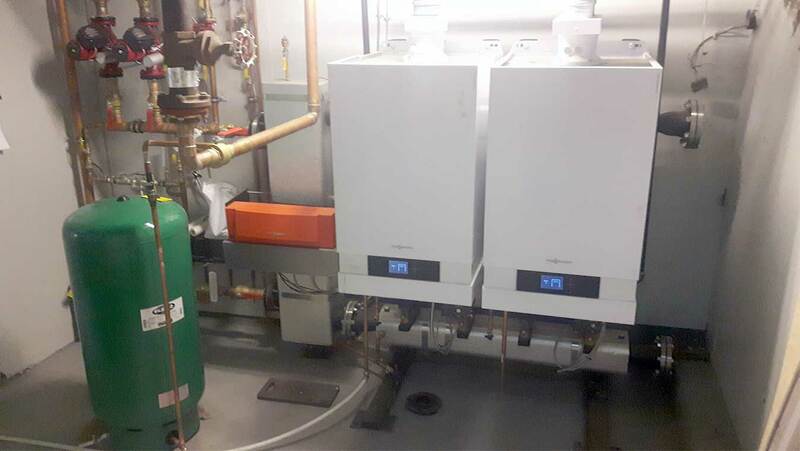 In the case at Kelson Court, the original boiler was replaced earlier this year with two high efficiency boilers, which control the heat and hot water for the building. Building A & C will be upgraded through the same kind of equipment swap out in 2018-2019. "The most noticeable energy improvements will be felt during spring and fall when the boiler can run at a lower temperature and adjust automatically to varied daily temperatures," said Kelly Fawcett, VP of Maintenance and Construction at Kelson. As part of its acceptance into the Fortis program, Kelson Court suites were also equipped with water-efficient shower heads and kitchen and bathroom faucet aerators at no cost to Kelson Group. See our webpage for more information on Kelson Court Apartments for rent in Prince George.